Today GENETIC has an entirely different meaning. Realizing this, Ron changed our catalog pages to refer to NATURAL Dwarf. The original natural dwarf peach came from Tibet or north China in 1939. Mr. Flory from Modesto was in the area as a US Army engineer when he ate peaches from naturally dwarf trees about 4’ – 5’ tall. These were bushes in the home yards. He brought back seeds to grow in Modesto. CA. This is the only peach seed we can plant which appears to come up as a Flory Peach if the flower has not been cross pollinated. All other peach seed varieties will pick up past parentage, so will have big variations. All Natural (Genetic) Dwarf peaches and nectarines in the United State came from the Flory Peach or its progeny. David Armstrong did some of the first crosses and Fred Anderson did thousands of crosses using progeny from Flory. Flory is a white flesh, cling stone, sweet peach. The tree has large double bright red blossoms, 400 chilling, and ripens in late July. Mature height is 5’. Armstrong developed Natural Dwarf flowering peaches – red, white, and pink. The Bonanza Peach and Necatrina Nectarine are Armstrong hybrids. Fred Anderson took Bonanza, a June freestone yellow flesh peach, and crossed it with a late standard nectarine. Mr. Anderson’s crosses resulted in short and tall peaches and nectarines. He had yellow and white flesh, free and cling stone, and early to late fruit. Some were 4’ tall, others 6’ tall, etc. When crossing the peach and nectarine you can have all combinations in flesh, ripening dates, chilling needs, height, etc. I worked with Mr. Anderson in selecting our 9 patents. Mr. Anderson’s protégé, Norman Bradford, continues some of his work which includes one of our patents. No chemicals or radiation has been involved. All are natural crosses like most other peaches and nectarines. Some are sports where one bud or limb comes out different. An example is Santa Barbara peach which was one limb from a Ventura Peach; 200 fewer chill hours and more flavor and sugar. Even with asexual reproduction where 99% of 1,000 buds could be true to the original tree, a bud can be very different. We sell many such sports. Hybridizing, whether crossing of pollen by man or insects, results in modified varieties, but nature often creates others through sports. To my knowledge, all genetic peaches and nectarines are through hybridization, so considered natural. Genetic dwarf peaches and nectarines began with the Flory Peach. (Note: We are now calling them "Natural Dwarfs" - to distance them from current "GMO" histeria.) In the summer of 1939 an United States Army engineer was in northern China. He found a small peach tree in a Chinese family's yard and sampled some of the fruit. He obtained several peach pits which he brought to Modesto, California. This was a rare find as the Flory Peach pit basically comes true to the original tree. The flower was large double dark crimson color with white flesh fruit. The tree had a maximum height of 5 feet with long narrow leaves. 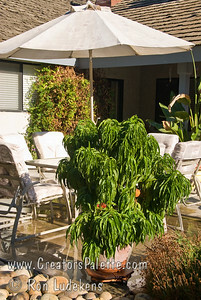 The tree makes an attractive round shrub with dark green foliage. In the early 1960's, fruit breeder Fred Anderson started making crosses with nectarines as well as did David Armstrong of Armstrong Nurseries. 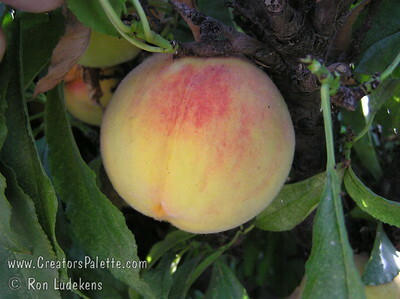 Mr. Anderson's hybrids were developed with Mr. Bob Ludekens of the L. E. Cooke Co.
November 20, 1962, Golden Prolific Nectarine was the first patent the L. E. Cooke Co. introduced. This nectarine is a cross of Flory, the early ripening, white, freestone peach and Late Le Grand Nectarine, a yellow, cling, late ripening fruit. 900 hour chilling. Please note the genetic possibilities: a peach or nectarine, early or late ripening, large tree or dwarf, white or yellow flesh, cling or freestone. Mr. Anderson planted seed in rows and Mr. Ludekens walked the rows. Tall trees were cut out. The foliage let us know if a yellow or white flesh. There were a few semi-dwarf. As the fruit were mostly cling, these trees were cut off leaving genetic/natural dwarf freestone peach or nectarine. The first selected was a freestone yellow nectarine with the strong flavor of the late Le Grand Nectarine. 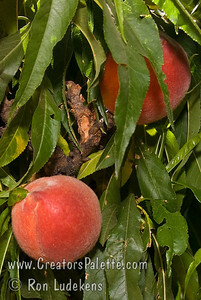 A few months later, Armstrong Nurseries introduced Bonanza Peach. I do not remember the parentage except the Flory and a mild winter yellow peach. December 3, 1963, a year later, Silver Prolific Nectarine was introduced. Both nectarines bore very well so the name Prolific was again used. This hybrid was a freestone, white flesh nectarine. The tree grew 24 inches taller than Golden Prolific. The company eventually discontinued production as it had a problem in wet media and produced a clear gum which nurseries felt was caused by borers. The fruit was sweet, but lacked strong flavor. 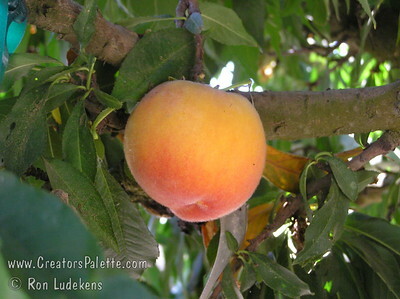 July 2, 1964 the patent was granted for Golden Glory Peach with the same parentage as the nectarines. Golden Glory has a very large peach with a maximum tree height and spread of six feet. Another L. E. Cooke Co. introduction. June 8, 1965, Empress Peach, a hardy yellow flesh cling peach was introduced. This selection is sold in the cold winter areas. 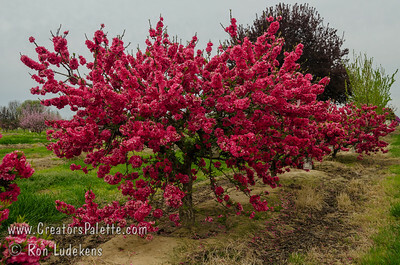 Beautiful spring season blooms come from the nectarine parentage. October 7, 1969 Armstrong introduced Nectarina Nectarine. The L. E. Cooke Co was looking for more mild winter genetic dwarfs, so Mr. Anderson started planting the peach and nectarine pits from the previous patents. These were crosses of dwarf peaches and dwarf nectarines and had those favorable features in the pits. One result was a medium size very good flavored yellow nectarine but a cling and not as mild winter selection we needed. February 12, 1974, the L. E. Cooke Co patent Southern Rose Peach was introduced. This selection is a low 250 hour chill, yellow flesh, freestone peach we were looking for. September 17, 1974, the L. E. Cooke Co patent Southern Flame Peach became available. 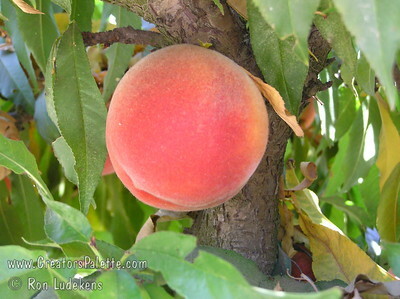 This 400 hour, natural dwarf peach with good flavor and July ripening is one of my favorites. August 5, 1975, the L. E. Cooke Co received two patents: Southern Sweet Peach, a June ripening, sweet, freestone at 500 hour chill and Southern Belle Nectarine a strong flavored, August ripening, large freestone nectarine with a low 300 hour chilling requirement. The 1974-75 varieties were crosses with the natural dwarf Empress Peach and Armstrong Bonanza peach. This is a cross of two natural peaches but Empress had a nectarine as a parent, so our results were peaches and nectarines, more genetic and shorter trees. Mr. Fred Anderson had more than 100 patents and many were nectarines. He became the best known hybridizer of nectarines. This took extreme patience. The last L. E. Cooke Co genetic dwarf patent was Red Sunset Nectarine. This was developed by Mr. Norman Glen Bradford who had worked for Mr. Anderson. The patent was entered August 15, 1989. Red Sunset is a large, colorful, yellow juicy, freestone, firm flesh nectarine. The tree has heavy production and the fruit ripens in June. The maximum tree height is 5 feet and more compact than the others, but heavy set with good dark green foliage and colorful flowers. This is another mild winter selection (400 hours chilling). The L. E. Cooke Co now had June, July, August ripening natural dwarf nectarines and peaches for mild winter areas and a few for the colder climates. As a whole, the Natural Dwarf line has proven to be wonderful additions to the home garden. As yard sizes continue to dwindle, these dwarf (4 to 6 feet high and wide), prolific, good tasting peaches and nectarines become more in favor. They are often called "Patio Peaches" or "Patio Nectarines" since they can be grown in large pots or half whiskey barrels and kept on the patio, balcony, porches and small gardens around the patio.